The 2017 Mido Fair which just ended was a fantastic event for OKIA - owner of the patented HDA® Technology - which was among the star players again this year at the most famous international eyewear show. 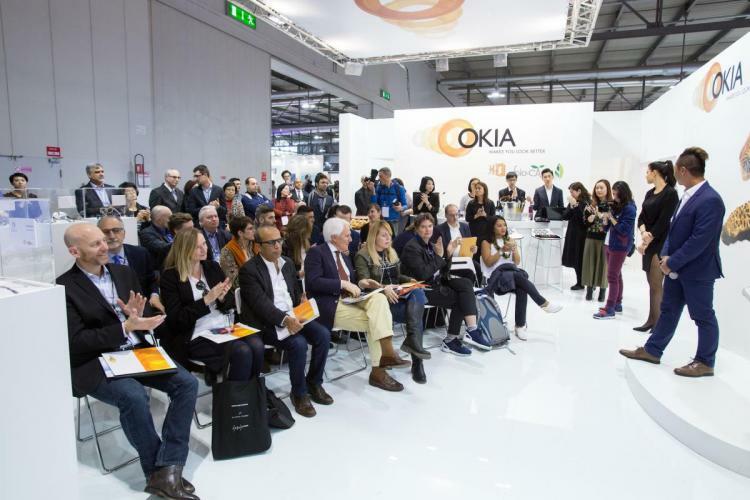 Playing to its strengths of innovation, creativity and passion, OKIA attended the Milan exhibition with an extremely refined booth that attracted an ongoing crowd of visitors and optics specialists during the three days of the show. A Press Conference was held at the OKIA booth on February 26th to officially introduce the worldwide trade press to the latest goals reached by the company. Art Deco, Galaxy Glacier and Gold Paradise - the irresistible new HDA® collections launched at Mido – were welcomed very positively thanks to their sensational mix of high technology and fashion. A huge interest was raised as well by 360 Hinge - a 360o rotated integrated hinge with worldwide invention patent by OKIA - and the revolutionary 100% bio-degradable Bio Lens, which can be broken down into CO2 and H2O within 120 days. Finally, attendees were surprised by the preview of the innovative Wave by OKIA Tech, an integrated eyewear technology transmitting sound waves directly to your ears that perfectly reflects OKIA’s commitment to develop state-of-the-art eyewear solutions for the future. “It was a hugely successful Mido, a fact corroborated by both our Italian and foreign customers”, stated the company’s Head of Customer Project Management, Mabel Lam. “This extremely positive outcome was made possible, first and foremost, by the infinite and amazing possibilities that our patented HDA® Technology allows in terms of creativity and customization, which keep on surprising our clients year after year”. OKIA launches “Art Deco”, a surprising new collection that once again shows and highlights the extraordinary possibilities offered by the patented HDA® Technology in terms of creativity and eyewear design. As a result of the ongoing research and improvement of this globally known technology, the “Art Deco” collection combines the high quality and impact resistance of High Definition Acetate with a unique design concept inspired to the popular art deco style. Smooth lines, geometric shapes and bright, sometimes garish colours in repetitive patterns: these were the key features of Art Deco – the celebrated art movement that aimed at giving objects a futuristic look – and these same design elements can be found in the new OKIA collection, which is all about elegance and sophistication. 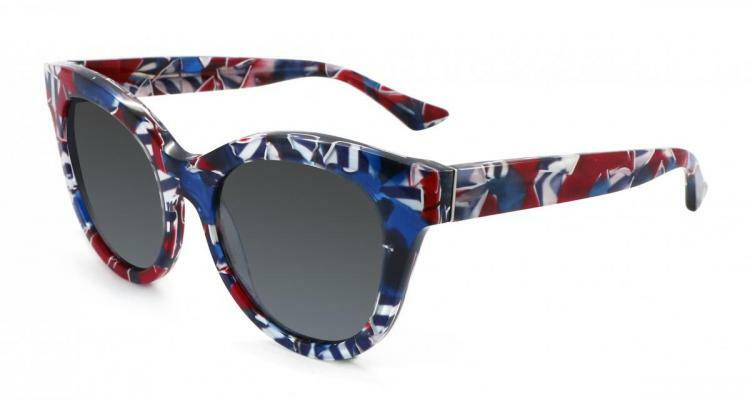 Thanks to the application of the HDA® Technology, countless triangular patterns are mixed together inside the acetate and create an attractive combination of quirky and vivid colours. The infinite crossover of clean-cut stripy motifs and plain colours produces an impressive visual effect that brings attention to the frame and makes it look like an artwork. Just like Art Deco artists, OKIA has developed a collection that is simultaneously taking from the past and looking to the future with a distinctive style that grips the consumer’s imagination. Dedicated to men and women who love new ideas and experiences, “Art Deco” is the real must-have for the coming months, a proposal that won’t go unnoticed thanks to its sleek and contemporary appeal. Whether you have a love for astronomy or simply enjoy gazing at the stars, the new “Galaxy Glacier” collection developed by OKIA will definitely satisfy your interest in outer space and its unexplored secrets. Space style is a hot fashion trend that keeps on inspiring designers with galactic looks and futuristic materials aiming to create real “down to Mars” girls. The new “Galaxy Glacier” collection launched by OKIA mixes the company’s endless pursuit of innovative ideas with this increasing interest towards outer planets and the universe. 3D blocks in different gradient colors are laminated inside the acetate to evoke a cosmic landscape made of rocks and glaciers, while thanks to the CSB (Crazy Sparkling Beauty) technique precious gold decorations create the sensational effect of a sky full of shining stars. By means of this amazing mix, an impressive three-dimensional and sparkling outcome is produced within the acetate base, for an unmatched look and feel. “Galaxy Glacier” represents another extraordinary success reached by OKIA through the application of the patented HDA® Technology. This well-known technology allows infinite possibilities in terms of creativity and design, translating every kind of inspirational pattern on acetate sheets. Thanks to HDA® Technology, unconventional galactic patterns are shown on acetate to take you to a world of otherworldly fashion far away from your home planet. EXPRESS YOUR GOLD PASSION WITH THE NEW “GOLD PARADISE” COLLECTION BY OKIA! Luxurious and glamorous, the new “Gold Paradise” collection developed by OKIA pays homage to the most precious colour ever: gold. Synonymous with opulence and refinement, splendour and eccentricity, gold shines everywhere in fashion, from clothes to accessories and jewellery. 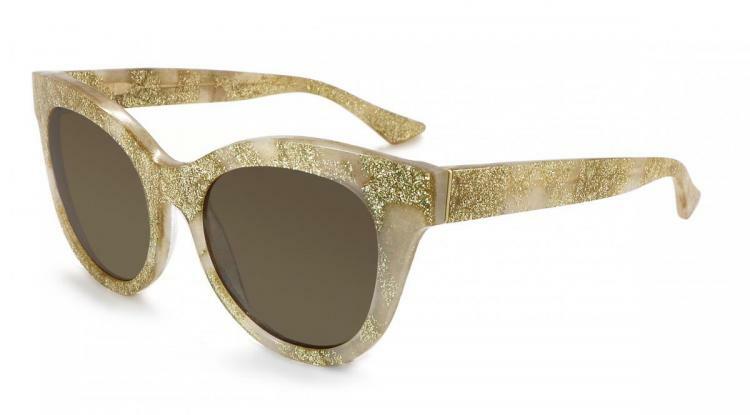 OKIA translates this endless trend into an eyewear collection that, mixing the gold colour with sparkling gold foil, becomes an authentic explosion of light. Thanks to the application of the CSB (Crazy Sparkling Beauty) technique, twinkling gold foil is shown within the acetate producing an extraordinary and sophisticated visual effect. Moreover, the application of the patented HDA® Technology creates a unique three-dimensional outcome that makes each frame even more eye-catching. The result is an enviable classy look, expression of the purest elegance. The new “Gold Paradise” collection is a true golden treasure reflecting a charming and contemporary style. Each model highlights OKIA’s commitment to cross the boundaries between fashion and technology, offering the right mix of classic beauty and modern inspiration.